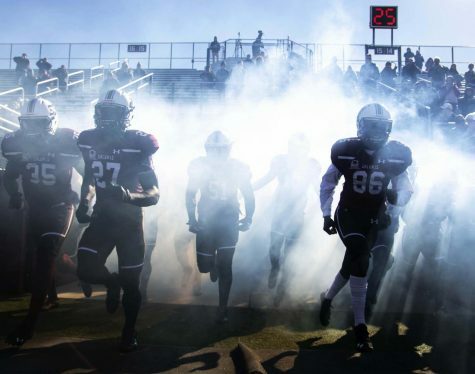 The SIU football team lost 24-17 to the University of Northern Iowa Panthers Saturday night at Saluki Stadium in the annual Black Out Cancer game. Southern opened up conference play on Saturday evening against the University of Northern Iowa (2-2, 1-0 MVFC). This was the 36th matchup between the two programs, with UNI claiming wins in each of the last three meetings between the programs to hold a 19-16 series record. It was also SIU’s seventh annual Black Out Cancer Game. Fans bid online last week to purchase a jersey and the rights to what name would be prominently displayed on the back. Many chose to honor a friend or family member affected by cancer by placing their name on the back of the player’s jersey. This year, the jersey sales raised $28,036 for the SIH Cancer Institute. SIU started with the ball when UNI won the toss and chose to defer to the second half. 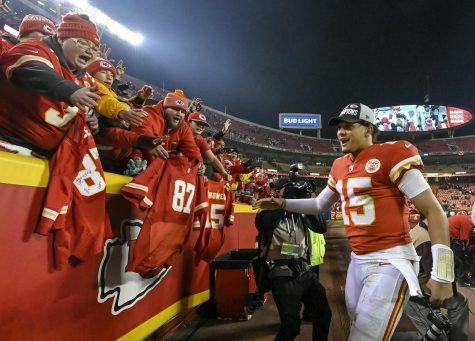 With the danger of going three-and-out, junior quarterback Sam Straub — donning the jersey name “Maguire U”, representing the historically fake Maguire University and it’s alumnus that have suffered from cancer — showed off his speed with an 11 yard rush. 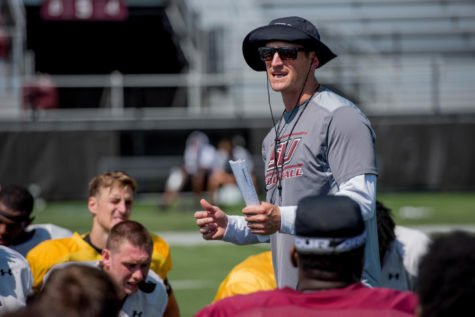 The Salukis were in the red zone and well on their way to scoring on their first drive of the game before a 15-yard low block penalty pushed the Salukis back, forcing them to attempt a 46-yard field goal. Sophomore kicker Matt Sotiropoulous’s kick came up just short, hitting the cross bar and giving UNI the ball on the 28-yard line. The SIU defense held strong in its first turn on the field, forcing UNI to punt after four plays in its first offensive drive. UNI opened up scoring with a 45-yard field goal from sophomore kicker Sam Drysdale. 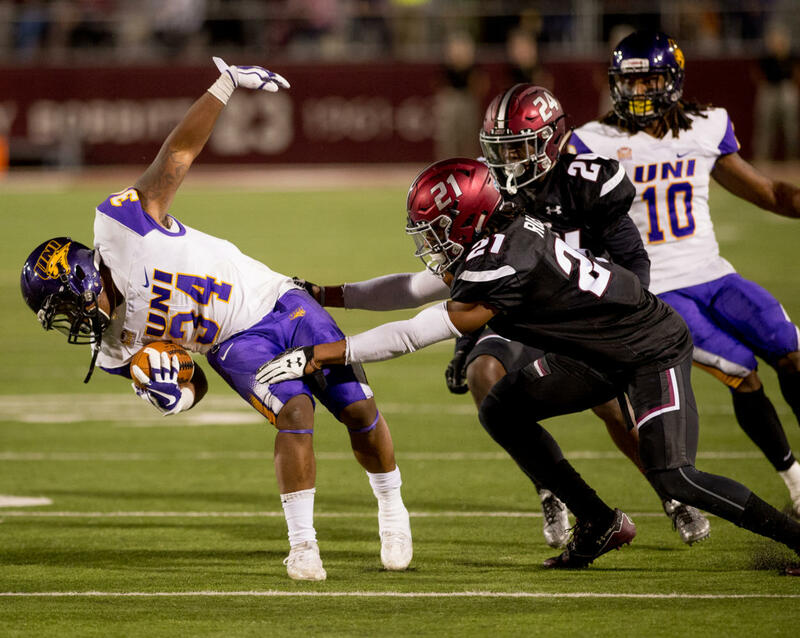 The Panthers had the opportunity for more points, but back-to-back passes in the end zone were knocked down by the Saluki defense, forcing the Panthers to settle for a field goal. UNI followed up the field goal with a seven play, 61-yard drive down the field, capped off with an 11-yard touchdown pass from quarterback Eli Dunne to wide receiver Daurice Fountain. The point after was good, making it 10-0 Northern Iowa to start the second quarter. 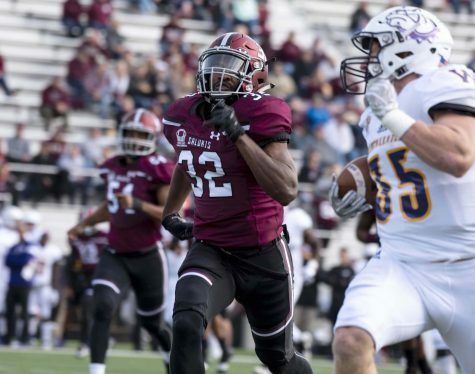 The Salukis worked their way into the red zone early in the second quarter with a collection of passes to senior wide receiver Connor Iwema, junior running back Daquan Isom and junior wide receiver Darrell James, but they were unable to reach the end zone, having to settle for a 32-yard field goal. 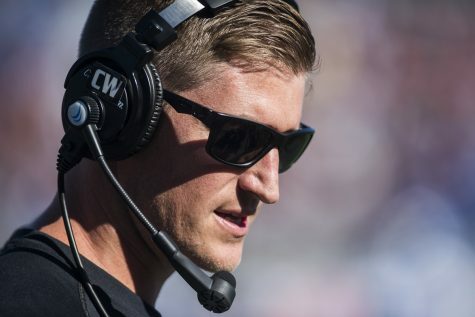 The Panthers answered quickly when Dunne connected with Fountain for a 42-yard pass to put them inside the Salukis’ 10-yard line. UNI scored on the very next play with a four-yard pass to tight end Elias Nissen. The point after was good, and Southern Illinois entered halftime trailing 17-3. 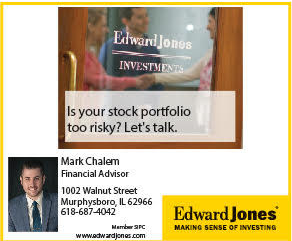 The Panthers came out strong to start the second half, marching the ball 50 yards down to the Saluki 30-yard line, but thanks to some clutch defense the Panthers came out of the four-minute-seventeen-second possession empty-handed. 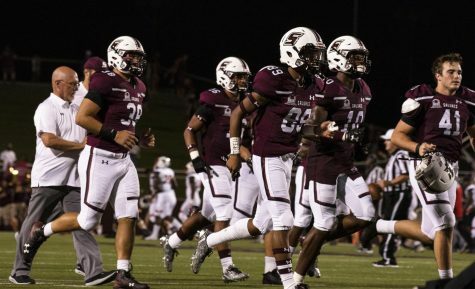 The defensive stand looked to be the spark that the Salukis needed to get going. With the offense now on the field, Isom recorded a 52-yard rush to the UNI 18-yard line. 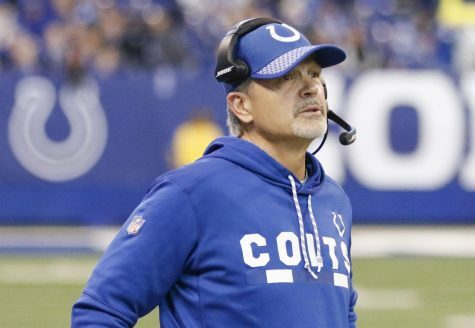 The offense struggled to get any closer to the endzone and were forced to attempt a field goal, but Sotiropoulos’s 35-yard field goal attempt sailed wide left for his second miss of the night. 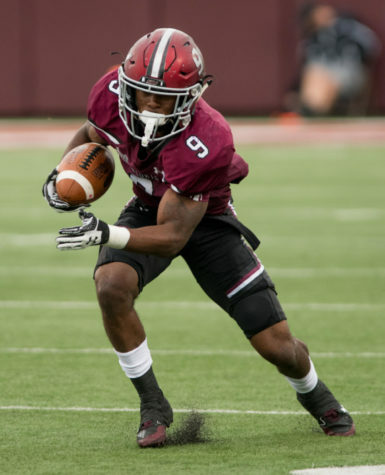 SIU finally put up a touchdown late in the 3rd quarter with a nine-play, 63-yard drive that was capped off by a 29-yard pass to Darrell James. The point after was good and suddenly Saluki Stadium got a lot louder as the score drew closer at 17-10 in favor of UNI. Northern Iowa was not phased, answering with a seven-play, 86-yard touchdown drive to reclaim a 14-point lead, 24-10. After a quick scoreless drive by Southern Illinois, it looked like Northern Iowa was going to march down the field again. 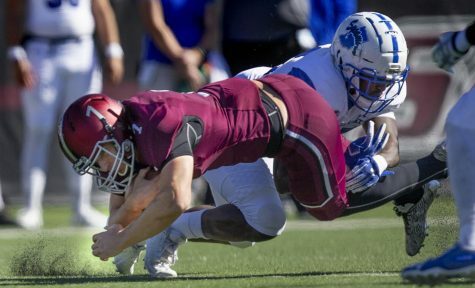 Senior inside linebacker Kyron Watson had other plans, forcing and recovering a fumble to give SIU the ball on its own 46-yard line. The momentum carried over to the defense, capping a three-and-out stop with a 12-yard sack by sophomore linebacker Kamahl March. The offense started off their next drive strong with a 21-yard reception by Iwema, but a fumble by Varble stifled the drive. The Panthers took the Saluki turnover and managed to eat about six minutes off the clock, giving SIU the ball with 3:43 to go in the game. Southern drove the ball all the way down to the 9-yard line, but Straub’s ensuing pass bounced off of Isom’s hands and into the hands of UNI linebacker Jake Hartford, all but ending the game. Despite the loss, a couple Salukis shined in the game. Iwema collected 99 recieving yards, putting him over the 1,000-yard career receiving mark. Darrell James followed close behind with 97 receiving yards and one touchdown reception; also surpassed the 1000-yard mark. Daquan Isom led the team in rushing with 126 yards over 16 carries. 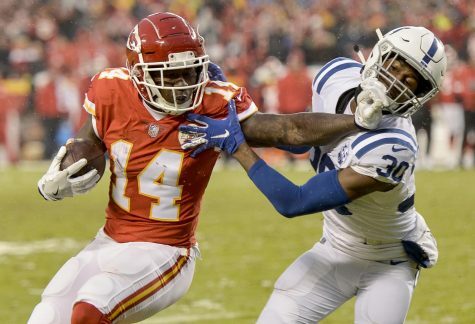 “I felt like this was Daquan’s best game,” Hill said. Starting quarterback Straub struggled most of the night, completing only 46.9% of his passes. Place-kicker Sotiropoulos also struggled, missing two field goals, which could have changed the game and how the last drive was approached. 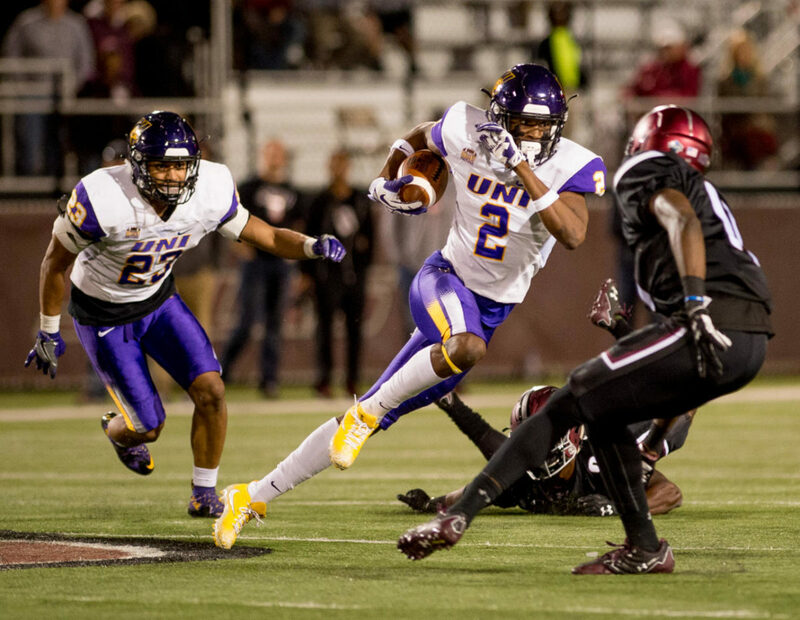 This was the first time since 2013 that the Salukis allowed less than 40 points by UNI. 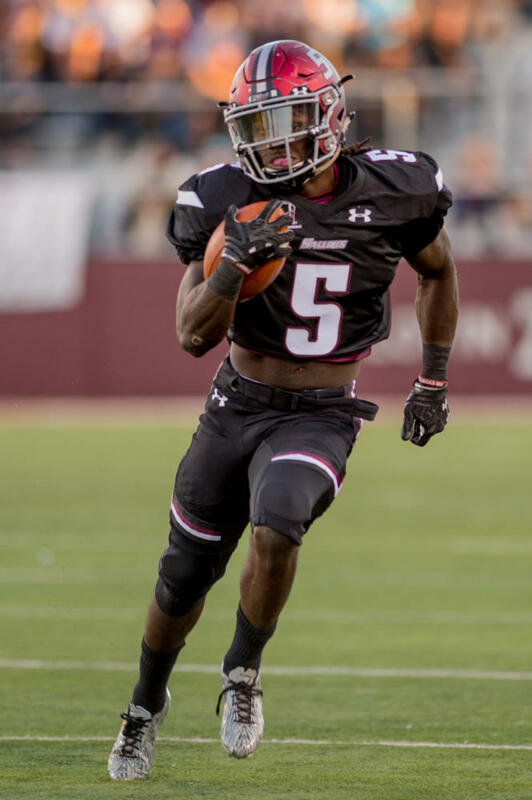 Three Salukis posted double-digit tackling numbers, senior linebacker Kyron Watson, senior safety Ryan Neal, and sophomore safety Jeremy Chinn. Neal also recorded a sack for an 11-yard loss. 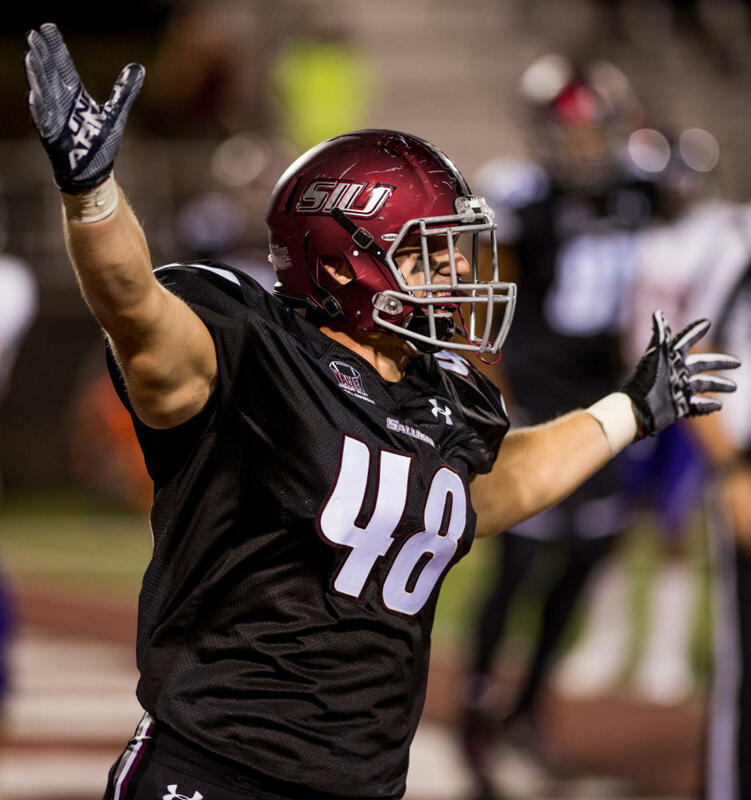 SIU (2-2, 0-1 MVFC) faces off at 6 p.m next Saturday in Brookings, South Dakota against the South Dakota State University Jackrabbits in the second conference game of the season.